This is my post for Wine Blogging Wednesday 74 - Value Sparkling Wine. I did briefly think about Champagne Pierre Gimonnet, because it's so good that I believe it offers great value for money, but the price of one bottle of the Gimonnet gets me four of tonight's wine, with enough left over for a bag of posh crisps. 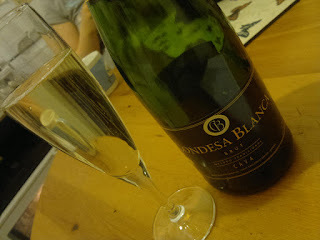 Condesa Blanca Cava NV is really rather hoopy. It's a simple wine, although if you pay closer attention it doesn't fall apart - there is careful wine making here, and good accurate flavours. There's a very refreshing lemon & grapefruit palate, and something which I think might be floral. It is absolutely bone dry, in a way that seems to speak more of chalk than of tart citric acidity. In the making of this wine the Cavaliers* use the same expensive, time-consuming procedures as the Champenois. Granted, the wine is only matured for 15 months rather than the three years of champagne, but this bottle only costs £7. It's not champagne - lacks the finesse, the lace-like texture - but it only costs £7. That makes it everyday drinking material. Who needs finesse? And finally, the Condesa Blanca comes with a brilliant food match - fairy cakes. Not iced fairy cakes, just fresh, plain little vanilla sponges. Delicious. Condesa Blanca Cava Brut NV - delicious: 3-4 (good to excellent). * Cavaliers. Ok, I made that one up. No habla español. If you liked this one that much you need to really upgrade! :) Many Cava's can even surpass Champers in terms of finnesse. Also Champagne only requires 1.5 years of aging to be real Champagne though it often gets more time...as does many Cava's. If you want to really fall in love with Cava try a Recaredo or Mestres. These compete at a whole new level. Thanks for posting again this month. Cava tends to be a very good value these days. Cheers! @ryan Oops. Yup, 18 months for champagne, unless it's vintage, in which case it's three years ageing. And I'll look out for the Recaredo / Mestres.